The purpose of this paper is to investigate the factors that affect the dropout of adult learners in e-learning through an in-depth literature review on the dropout of adult learners in e-learning. Based on variables identified from the literature review of dropout in e-learning and the models of dropout dealt with five constructs were categorized: individual background, motivation, academic integration, social integration, and technological environment. Jun, J. (2005). Understanding E-dropout?. International Journal on E-Learning, 4 (2), 229-240. Norfolk, VA: Association for the Advancement of Computing in Education (AACE). Retrieved April 25, 2019 from https://www.learntechlib.org/primary/p/4620/. Chyung, S. Y. (2001a). Conducting learner analysis to adjust online instruction for your faceless learners. Paper presented at the 17th Annual Conference on Distance Learning & Teaching, Monona Terrace, Madison, WI. Chyung, S. Y.
Chyung, S. Y, Winiecki, D. J., & Fenner, J. A. (1998). A case study: Increase enrollment by reducing dropout rates in adult distance education (Clearinghouse No. IR018989). In Distance Learning '98. Proceedings of the Annual Conference on Distance Teaching & Learning. Madison, WI. (ERIC Document Reproduction Service No. ED422848). Driscoll, M. (1998). Web-based training: Using technology to design adult learning experiences. San Francisco: Jossey-Bass/Pfeiffer. Ganzel, R. (2000). Associated learning [Electronic version]. Online Leaning Magazine, May 2001, 36-41. Retrieved from http://www.onlinelearningmag.com/new/may01/printer/eat2prt.htm Greer, L. B., Hudson, L., & Paugh, R. (1998). Students support services and success factors for adult online learners. Paper presented at the 28th Annual Conference of the International Society for the Exploration of Teaching Alternatives, Cocoa Beach, FL. Horton, W. (2000). Designing web-based training. New York: John Wiley & Sons. Khan, B. H., & Vega, R. (1997). Factors to consider when evaluating a Web-based instruction course: A survey. In B. H. Khan (Ed. ), Web-based instruction (pp. 375-378). Englewood Cliffs, NJ: Educational Technology Publications. Lim, C. K. (2001). 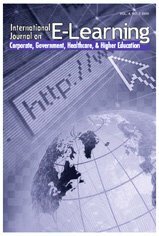 Computer self-efficacy, academic self-concept, and other predictors of satisfaction and future participation of adult distance learners. The American Journal of Distance Education, 15(2), 41-51. National Alliance of Business. (2000). Will e-learning transform corporate training? WorkAmerica, 17(9), 1-7. Towles, D. E., Ellis, J. R., & Spencer, J. (1993). Student persistence in a distance education program: The effect of faculty-initiated contact. Paper presented at the 33rd Annual Forum of the Association for Institutional Research, Chicago, IL. Vrasidas, C., & McIsaac, M. S. (1999). Factor influencing interaction in an online course. The American Journal of Distance Education, 13(3), 22-36. Whiteman, J. A. M. (2001). Relevance of education & Training in a business environment. Clearinghouse No. CE082060). (ERIC Document Reproduction Service No. ED455419).